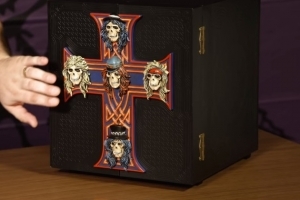 Appetite For Destruction: Locked N’ Loaded The Debut Album has been remastered and expanded and the box set is pretty massive and will take you sometime to go through it. Check out this 18-minute long video of the unboxing done by the band’s label. The Appetite for Destruction – Locked n’ Loaded box set comes out on Friday, features the unreleased studio recording of “Shadow of Your Love” which you can hear here on 105.7 The X. By the way…if you want this massive box set, get ready to pay for it, going price is $999.00. If your budget is similar to ours then perhaps you want to check out the Super Deluxe, Double LP, and Double CD options with price tags ranging from $179 to $19.98. Waste some time on the internet today and check out the unboxing below.